4 RMM2050 Two Way Radios. The RMM2050 is the replacement for the RDM2020. The RMM2050 operates on 5 license-free MURS frequencues. The RMM2050 is compatible with Motorola RDX VHF radios operating on MURS frequencies. One VHF Professional Two Way Radio Model RMM2050. 2100 mAh 3.7V Lithium Ion Rechargeable Battery. Standard Drop-In Charging Tray w/ Wall Adaptor. Swivel Belt Holster With 3.5 Spring Clip. The Motorola RMM2050 is a 2 Watt 5 Channel VHF two way radio. The Motorola RMM2050 operates on 27 VHF two way radio Business Exclusive Frequencies and offers 122 Privacy Codes to ensure private two way radio communication. The Motorola RMM2050 is pre-loaded with all 5 license free MURS frequencies. The RMM2050 will arrive programed to the default settings of MURS frequencies on both channels. The chart below will show you the programming on the first 2 channels of this radio as well as the other 3 MURS frequencies which you can easily change the radio to use following simple instructions in the owners manual. Channel 1 - 154.570. Channel 2 - 154.600. The Motorola RM Series - RMM2050 provides coverage of up to 250,000 sq. 20 floors, and up to 1 - 2 miles. Durable metal diecast chassis helps radios hold up under demanding conditions. The Motorola RM Series model RMM2050 meets Military 810 C, D, E, F and IP54/55 specifications for shock, rain, humidity, salt, fog, vibration, sand, dust, temperature shock, and high and low temperatures. This essentially means these radios will take a beating and makes them a top rated two way radio. While the RMM2050 radios aren't indestructible, they are designed to withstand a 5 foot drop on concrete, driving rains, and the dirtiest of environments making them the perfect choice for emergency two way radio communication. The RM Series model RMM2050 audio is 30% louder than previous Motorola XTN and AX models thanks to 2000mW audio output, speaker magnetic field reduction, wind-noise reduction and improved RF specifications. The speaker improvement on the RMM2050 makes communication clear. Flexible and Durable Battery Life Solutions. The Motorola RMM2050 rechargeable two way radios feature the standard LiIon battery (up to 12 hrs of life per charge). The Lithium Ion battery that comes with your RMM2050 is lightweight yet powerful. Now, through the enhanced technology in the RM Series model RMM2050, Motorola brings you an edge in performance that you can leverage in your company or facility. Business two-way radios (walkie talkies) are affordable and easy to use and have. Who Buys The Motrola RM Series - RMM2050? The Motorola RMM2050 is designed for industries such as: Construction, Warehousing, Education, Entertainment, and Retail. Retail: Apparel, Hardware, Pharmacy, Nursery, Liquor, Gas Stations, Car Dealers, Car Wash. Quickly get stock & price checks. Instantly deploy workers where needed. Accelerate training of new hires. Industrial: Manufacturing, Warehouse, Distribution Centers. Quickly request help, supplies, maintenance, quality control. Expedite requests & rush orders. Instantly react to injuries or emergencies. Property Management: Hotels, Resorts, Golf Courses, Apartments, Condos, Office Buildings, Sports Complexes. Improve response time to guest needs. Increase safety & security for guests, staff. Make new hires more productive. Schools: K-8, High, College, Athletics, Dormitory, Day Care. Instantly talk to teachers & staff. Increase safety & security for students, teachers, staff. Monitor crosswalks, playgrounds, facilities, dorms, parking lots, bus loading. Coordinating events, athletics, field trips. Contractors: Construction, Electrical, Interconnects, Mechanical, Installers, Comm Data. Coordinate wire pulling & installations. Increase safety & security for workers. Food Service: Restaurant, Banquet, Cafeteria, Bars, Meeting & Convention Facilitis. Improve table turns, increase revenue. Clean & set tables faster. Notify wait staff when orders are ready. Motorola 2 way radios are designed to provide better communication throughout the organization. Two way radios are sometimes referred to as walkie talkie radios. Motorola two way radios come in many sizes but most of the Motorola hand held radios we sell are small and compact. We provide both UHF and VHF 2 way radios as well as two way radio sets. All radios on the same order will be programmed to work with each other. We can provide custom 2 way radios to match your specific needs in most cases. We discount Motorola two way radios based on volume. The price reflected above is already a substantial savings over the Motorola suggested retail price. We do supply long range walkie talkie and long range two way radios options and offer repeaters systems to achieve your specific communication needs. Motorola portable radios can be outfitted with Motorola radio accessories to complete your communication needs. We sell a full line of headsets, replacement battery packs, charges and antennas. We offer a full line of Motorola Two Way Radios and have two way radio reviews listed throughout the site. We offer two way radios business & industrial supply & MRO commercial radios by Motorola as well as Vertex Standard. You can also find Motorola two way radio owners manuals, programming guides and other information listed for each radio. You can download Motorola 2 way radios software by visiting Motorola com. Most programming software is the same for UHF radios and VHF radios. You can increase radios by purchasing multiple radios at the same time to build your own Motorola two way radio sets. 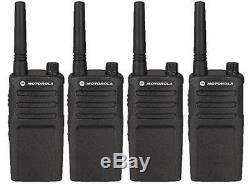 The item "4 Pack Motorola RMM2050 MURS Two Way Radio Walkie Talkie Free & Quick Shipping" is in sale since Thursday, April 21, 2016. This item is in the category "Consumer Electronics\Radio Communication\Walkie Talkies, Two-Way Radios". The seller is "allchargedupstore" and is located in Greer, South Carolina. This item can be shipped to United States.